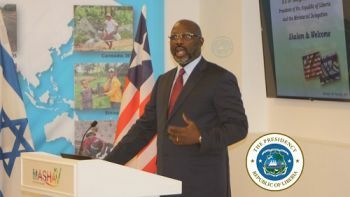 Monrovia, Liberia - The President of the Republic, His Excellency Dr. George Manneh Weah, consoled family members of fallen District 15 Representative, Adolf A. Lawrence when he paid a visit at the home of the family Monday, March 25, 2019. The late Lawrence, who was Representative of District 15, Montserrado County, died in a tragic motor accident on the Robertsfield Highway while returning to Monrovia from Buchanan, Grand Bassa County. Sitting by the widow of the fallen representative, who is also a member of the National Legislature, Senator Yonblee Karnga Lawrence, President Weah extended his condolence to the Lawrence family and encouraged them to be strong during their difficult time of bereavement. The President, who was joined by several officials of government at the home of the fallen lawmaker, said his government was deeply saddened by the tragic death of the representative. He expressed hope and prayer that God would grant the family solace. The late Rep. Lawrence was a member of the ruling Coalition for Democratic Change (CDC) of which President Weah is the Standard-bearer.